If the cross doesn't protect you, perhaps the blade will! 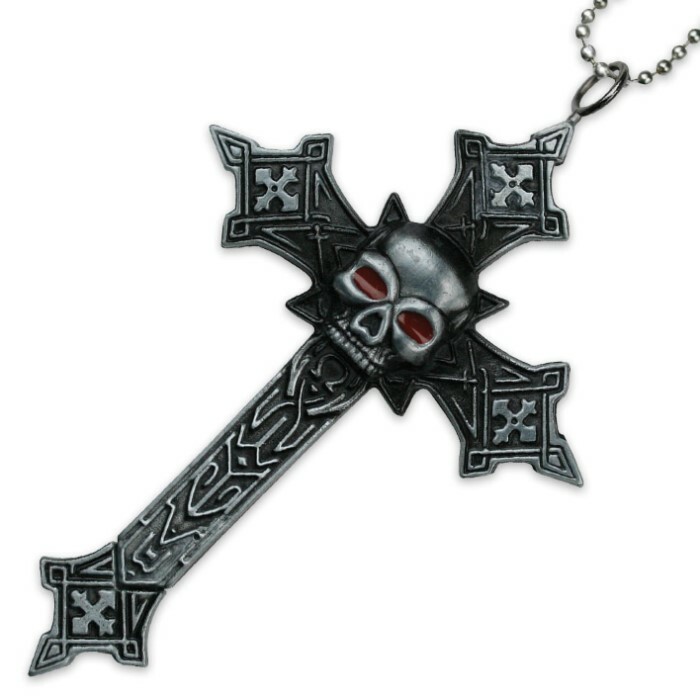 This gothic skull theme pendant measures 4 in. overall and houses a 1 1/2 in. stainless steel blade. 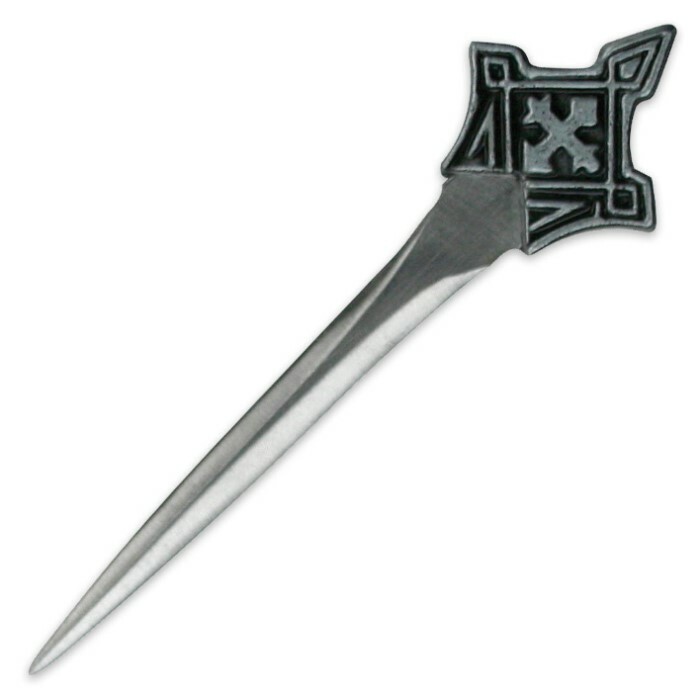 Simply pull on the bottom tip of the pendant to reveal the blade. Includes beaded chain. Initially I thought this product was a steal for the low price, but once I got it i was surely disappointed. It's cheap looking in person and the material feels like a cheap plastic. The blade is flimsy and unsharpened. Just a crappy product overall. I will be returning this. Its a nice size not too big had it for a.couple of days but d knife keeps falling off sometimes its kinda lose i just need stick the cross tighter together and c how it goes. other dan that nice necklace! I would not recommend getting this to anyone. I've had it for a week and it was great for five days, but now the blade won't stay inside its sheath for more then a few seconds. Got this in the mail in just 3 days! :D I don't get why people keep complaining about the size. I don't think it's that big or small. I got this for my friend who collects stuff like this. There's a lot of complaints about the size of the cross--I found that, though I was expecting it to be as large as it was, the design proportions made it look a little more awkward than it does in the picture. The cross itself, while made of metal, is an alloy that feels like plastic. Certainly not as weighty as I was expecting. On the plus side, the blade itself is wickedly sharp, though prone to falling out while running. I wouldn't recommend bringing this to a club, concert, or anywhere else where you might get bumped around. Overall: 3/5, because I had a general idea of what I was getting into (you get what you pay for), and the person I gave it to loved it. Buyers with higher expectations might be disappointed. 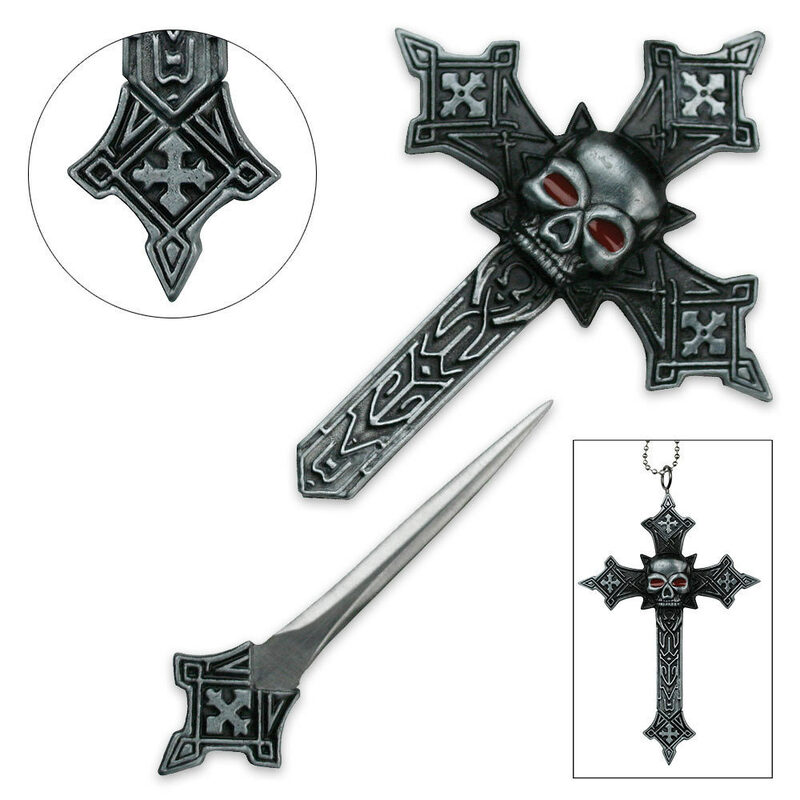 its a very large cross, i have yet to give it to me girlfriend but im sure shell love it, the dagger is razor sharp (i cut my thumb accidentally) and the chain looks pretty strong.